Winter is the season when all we want to do is hibernate under our duvets and binge-watch our favorite TV shows (Westworld, anyone?). But spending whole weekends in bed can destroy our will to maintain personal relationships or even just a kempt bedroom. This is a weekly challenge Kate Arends knows all too well. Arends, the brains behind Wit & Delight, a lifestyle blog and design consulting agency, lives in Saint Paul, Minnesota, where winter temperatures stay below 30 degrees during the day and approach a chilling zero at night. During such freezing temps, Arends says her “bedroom is a destination.” Her favorite things to do: “Have breakfast in bed. Relax after a long day with a glass of wine. Listen to records. Take your time getting ready for a date.” See a pattern here? 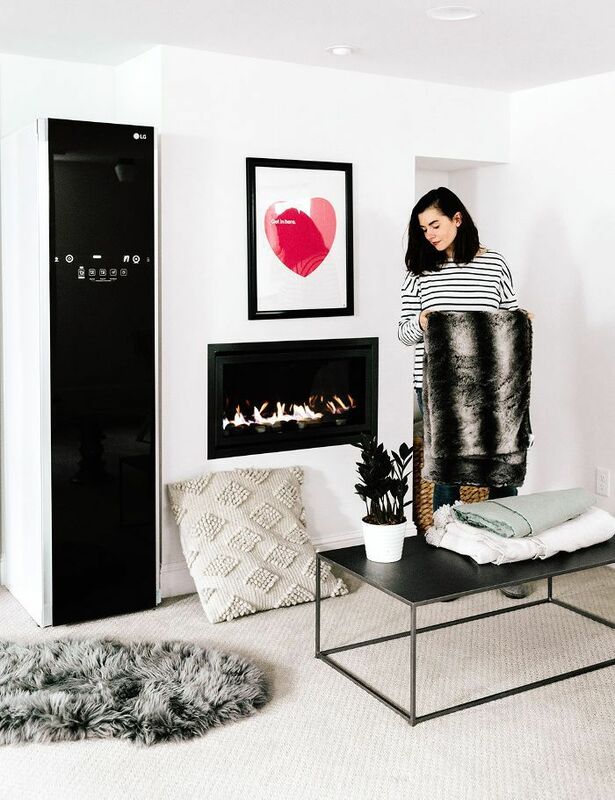 So to make sure her bedroom is a spring-fresh oasis for all her staying-in activities, she diligently sanitizes and cares for her bed linens, relying on cleaning must-haves like her at-home clothing management system, the LG Styler. Keep scrolling for the blogger’s top tips on transforming your bedroom into a spring-fresh haven all throughout winter. As Arends points out, you spend over a third of your life in bed, so you might as well invest in quality materials. “I’m talking pillows, mattresses, duvets, pajamas,” she says. “[And] to keep everything fresh, I love the TrueSteam™ function on the LG Styler; the hot steam quickly refreshes bedding and helps remove any wrinkles or odors.” Best of all, the LG Styler means the blogger can hold off on a trip to the dry cleaner—with a newborn in the house, running basic errands becomes a feat—especially this time of year. “If I need a piece cleaned, I’m able to do so on my schedule, which sometimes means 3 a.m.,” she says. 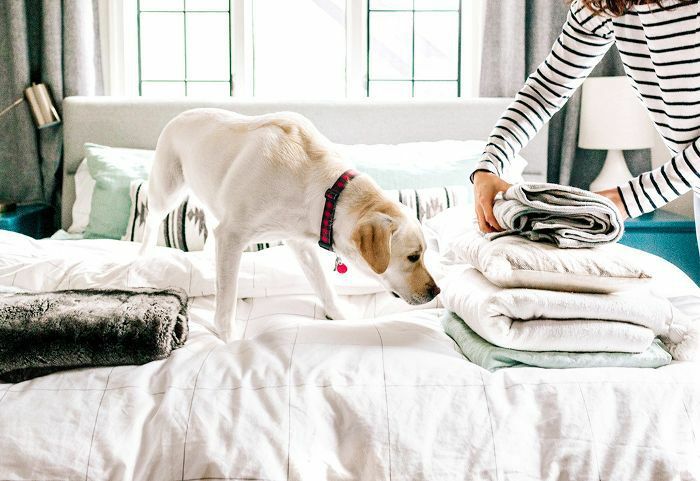 There’s one thing the Arends says people overlook when it comes to keeping their bedrooms fresh: “Greenery and plants bring the outside in,” she explains. “Not only do they add a pop of color, but certain plants can act as ‘air purifiers’ to clean the air.” Currently, we’re loving fig trees placed in sea-grass baskets as an alternative to planters. What’s your favorite part of your bedroom? Tell us in the comments below.